For four years, three laboratories on two continents have prepared the ICARUS particle detector to capture the interactions of mysterious particles called neutrinos at the U.S. Department of Energy’s Fermi National Accelerator Laboratory. On Tuesday, Aug. 14, ICARUS moved into its new Fermilab home, a recently completed building that houses the large, 20-meter-long neutrino hunter. Filled with 760 tons of liquid argon, it is one of the largest detectors of its kind in the world. With this move, ICARUS now sits in the path of Fermilab’s neutrino beam, a milestone that brings the detector one step closer to taking data. It’s also the final step in an international scientific handoff. From 2010 to 2014, ICARUS operated at the Italian Gran Sasso National Laboratory, run by the Italian National Institute for Nuclear Physics. Then the detector was sent to the European laboratory CERN, where it was refurbished for its future life at Fermilab, outside Chicago. In July 2017, ICARUS completed its trans-Atlantic trip to the American laboratory. Since 2017, Fermilab, working with its international partners, has been instrumenting the ICARUS building, getting it ready for the detector’s final, short move. Neutrinos are famously fleeting. They rarely interact with matter: Trillions of the subatomic particles pass through us every second without a trace. To catch them in the act of interacting, scientists build detectors of considerable size. The more massive the detector, the greater the chance that a neutrino stops inside it, enabling scientists to study the elusive particles. ICARUS’s 760 tons of liquid argon give neutrinos plenty of opportunity to interact. The interaction of a neutrino with an argon atom produces fast-moving charged particles. The charged particles liberate atomic electrons from the argon atoms as they pass by, and these tracks of electrons are drawn to planes of charged wires inside the detector. Scientists study the tracks to learn about the neutrino that kicked everything off. Rubbia himself spearheaded the effort to make use of liquid argon as a detection material more than 25 years ago, and that same technology is being developed for the future Fermilab neutrino physics program. ICARUS is one part of the Fermilab-hosted Short-Baseline Neutrino program, whose aim is to search for a hypothesized but never conclusively observed type of neutrino, known as a sterile neutrino. Scientists know of three neutrino types. The discovery of a fourth could reveal new physics about the evolution of the universe. It could also open an avenue for modeling dark matter, which constitutes 23 percent of the universe’s mass. ICARUS is the second of three Short-Baseline Neutrino detectors to be installed. The first, called MicroBooNE, began operating in 2015 and is currently taking data. The third, called the Short-Baseline Near Detector, is under construction. All use liquid argon. Fermilab’s powerful particle accelerators provide a plentiful supply of neutrinos and will send an intense beam of the particle through the three detectors — first SBND, then MicroBooNE, then ICARUS. Scientists will study the differences in data collected by the trio to get a precise handle on the neutrino’s behavior. The three Short-Baseline Neutrino experiments are just one part of Fermilab’s vibrant suite of experiments to study the subtle neutrino. NOvA, Fermilab’s largest operating neutrino experiment, studies a behavior called neutrino oscillation. The three neutrino types change character, morphing in and out of their types as they travel. NOvA researchers use two giant detectors spaced 500 miles apart — one at Fermilab and another in Ash River, Minnesota — to study this behavior. Another Fermilab experiment, called MINERvA, studies how neutrinos interact with nuclei of different elements, enabling other neutrino researchers to better interpret what they see in their detectors. The construction and operation of the three Short-Baseline Neutrino experiments are valuable not just for fundamental research, but also for the development of the international Deep Underground Neutrino Experiment (DUNE) and the Long-Baseline Neutrino Facility (LBNF), both hosted by Fermilab. DUNE will be the largest neutrino oscillation experiment ever built, sending particles 800 miles from Fermilab to Sanford Underground Research Facility in South Dakota. The detector in South Dakota, known as the DUNE far detector, is mammoth: Made of four modules — each as tall and wide as a four-story building and almost as long as a football field — it will be filled with 70,000 tons of liquid argon, about 100 times more than ICARUS. 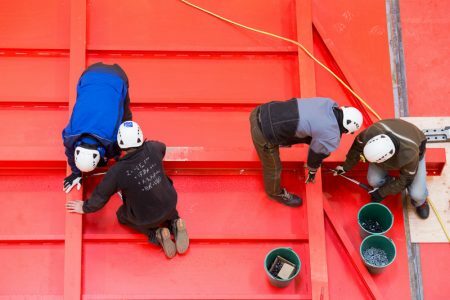 The knowledge and expertise scientists and engineers gain from running the Short-Baseline Neutrino experiments, including ICARUS, will inform the installation and operation of LBNF/DUNE, which is expected to start up in the mid-2020s. Eighty researchers from five countries collaborate on ICARUS. The collaboration will spend the next year instrumenting and commissioning the detector. They plan to begin taking data in 2019. Ester Anna Rita Casula is a postdoctoral researcher at the Italian National Institute of Nuclear Physics (INFN) of Cagliari – her hometown. She has been ALICE Run Manager for two weeks between June and August of this year. During her second week of shift, I meet Ester at point 2, where she spends most of her time monitoring the data taking and making sure everything runs smoothly. What’s you background and your career path up to now? I have studied Physics at the University of Cagliari, in Italy, and I have been a member of the ALICE collaboration since when I was working on my Bachelor’s Degree thesis. At that time, we didn’t have data yet, so I used Monte Carlo simulations. Then, for my Master’s Degree thesis and during my PhD I focused on the analysis of low masses in the di-muon channel – thus, mainly the F – in pp, Pb-Pb and p-Pb collisions at all of the energies we have taken data with. I started with the data from pp collisions at 7 TeV – for my Master’s thesis – and then continued with the other energies and with p-Pb and Pb-Pb data (in detail: pp at 2.76 and 5 TeV, p-Pb at 5 TeV, Pb-Pb at 2.76 and 5 TeV). After completing my PhD in 2014, I started a first postdoc with the University of Cagliari and now I am concluding a second postdoc with the INFN in the same town. I am based in Cagliari, but in the last months I have spent most of my time at CERN and, in particular, in the control room, since I have also followed some runs as a shift leader. How do you like being the run manager? It is an interesting experience: every day you might have to face a different problem. For example, during my shift once we were called by the LHC control room to be informed that ALICE was causing the dump of the beam. Of course, we had to solve the issue very quickly. It happened in the dead of the night and I was at home. As soon as I received the call by the shift leader I got up and went to the control room. Luckily I am staying nearby, in Saint-Genis. In situations like this you have to react quickly, try to understand the issue as fast as you can and take decisions. In this specific case, the problem was caused by the threshold of the Beam Control Monitors (BCM), which are basically protection devices. We called the expert on call for the BCM, who checked the situation and fixed this issue. Even though the problem seemed to be solved, I kept staying in the control room until 5 am, because I was worried that something else could happen. What do you like the most of this role? Certainly this, the fact that you need to keep under control and solve different kinds of issues. In addition, you have to give instructions and take decisions: this is quite challenging, if you are not used to it. Actually, you start training in taking responsibilities already when you are the shift leader. When you become run manager, you go a little step forward. I spend a lot of time in the control room and, when I am at home, I check continuously the electronic log to know how the run is proceeding. When I wake up in the morning, the first thing I do – even before standing up – is checking online the status of the accelerator, to know if it is working, and of the experiment. Well, it can be stressing sometimes, indeed. In particular because you have to be ready and react quickly; but, actually, I am finding it easier this week, since it is my second time as run manager. You can count on the run coordinator anyway, right? Sure. But we call her only if something very important happens. For normal issues, such as a shift leader having some doubts about the operations to perform, the run manager takes on the responsibility. Certainly, it is important to know what the most common issues are. That is why, before starting my first shift, I overlapped with the previous run manager for some days. What’s your main field of interest? I work on the analysis of the F in Pb-Pb collisions. An article on this topic based on data at 2.75 TeV is in preparation and now we are analyzing data from collisions at 5 TeV. I am quite specialized on this topic. Would you like to change topic to do something different? Actually, when I was doing my first steps in the analysis, I made some study on the U, but it was based on simulations only, so it was more of an exercise than a real analysis. Anyway, I will see. I will have to evaluate the opportunities. My postdoctoral contract at INFN will get to an end soon, so I will have to look for another job. I would prefer to keep staying in Cagliari, but I am also taking into consideration the possibility to make an experience in another country. Where? Or where absolutely not? Well, preferably in Europe, but not necessarily. Certainly I would avoid cold places… [She laughs]. I don’t know. I have been a tutor for two courses at the University, which means that I helped the professor with the laboratory lessons. It was an interesting experience, but I am not particularly attracted to teaching, mainly because it takes a lot of time to prepare classes and find the right way to explain complex topics. Thus, I guess you would prefer to work for a Laboratory, as you are doing at INFN? Ideally yes, I would prefer to focus only on research. Nevertheless, I don’t exclude the academic career either. I think that I can enjoy part of the process of training students, even though I think it can be hard and tiring. I have three at my place, in Cagliari. Three more are looked after by some friends of mine but I make them participate in competitions as well. What moves you to do this? I love them. I have even created the world online database of the Italian hounds, which didn’t exist before. I started it by myself, then I got some help from other three breeders in US and France. We have registered about 60,000 dogs. Unfortunately, we could go backward only till the end of the 19th century. Lately, the national dog clubs are putting information online, but in order to collect old data I had to rely on the original documentation. So, I went personally to the headquarters of the Italian National Dog Institution (ENCI) in Milan and photocopied all the certificates they have, from 1912 up to now. This is cool, but why did you do it? This experimental physicist has followed the ICARUS neutrino detector from Gran Sasso to Geneva to Chicago. Physicist Angela Fava has been at the enormous ICARUS detector’s side for over a decade. 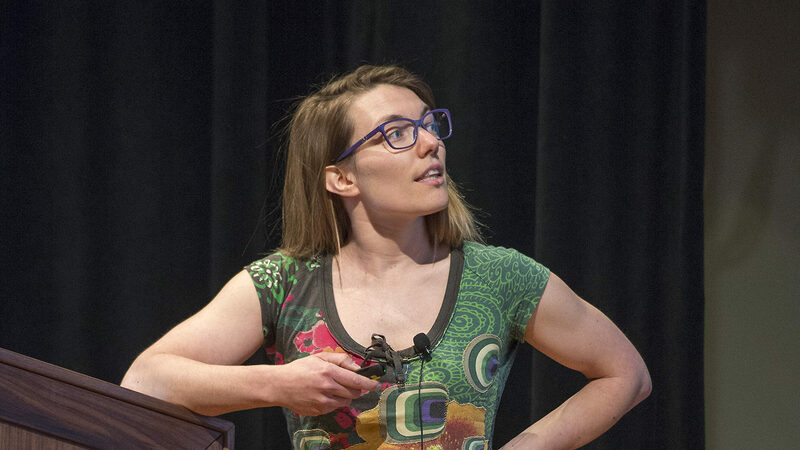 As an undergraduate student in Italy in 2006, she worked on basic hardware for the neutrino hunting experiment: tightening bolts and screws, connecting and reconnecting cables, learning how the detector worked inside and out. ICARUS (short for Imaging Cosmic And Rare Underground Signals) first began operating for research in 2010, studying a beam of neutrinos created at European laboratory CERN and launched straight through the earth hundreds of miles to the detector’s underground home at INFN Gran Sasso National Laboratory. In 2014, the detector moved to CERN for refurbishing, and Fava relocated with it. 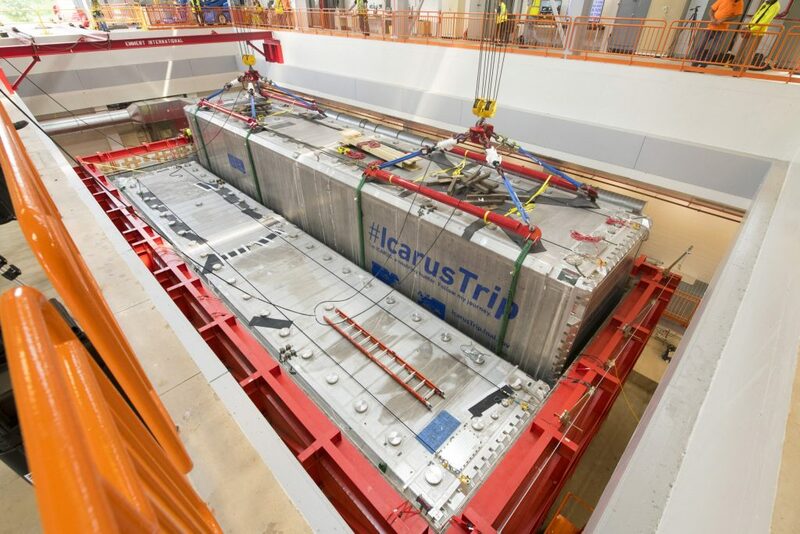 In June ICARUS began a journey across the ocean to the US Department of Energy’s Fermi National Accelerator Laboratory to take part in a new neutrino experiment. When it arrives today, Fava will be waiting. Fava will go through the installation process she helped with as a student, this time as an expert. Caraban Gonzalez, Noemi Ordan, Julien Marius, CERN. As a child growing up between Venice and the Alps, Fava always thought she would pursue a career in math. But during a one-week summer workshop before her final year of high school in 2000, she was drawn to experimental physics. At the workshop, she realized she had more in common with physicists. Around the same time, she read about new discoveries related to neutral, rarely interacting particles called neutrinos. Scientists had recently been surprised to find that the extremely light particles actually had mass and that different types of neutrinos could change into one another. And there was still much more to learn about the ghostlike particles. At the start of college in 2001, Fava immediately joined the University of Padua neutrino group. For her undergraduate thesis research, she focused on the production of hadrons, making measurements essential to studying the production of neutrinos. In 2004, her research advisor Alberto Guglielmi and his group joined the ICARUS collaboration, and she’s been a part of it ever since. Fava remained at the University of Padua in the same research group for her graduate work. During those years, she spent about half of her time at the ICARUS detector, helping bring it to life at Gran Sasso. Once all the bolts were tightened and the cables were attached, ICARUS scientists began to pursue their goal of using the detector to study how neutrinos change from one type to another. During operation, Fava switched gears to create databases to store and log the data. She wrote code to automate the data acquisition system and triggering, which differentiates between neutrino events and background such as passing cosmic rays. “I was trying to take part in whatever activity was going on just to learn as much as possible,” she says. Adapting to changing circumstances is a skill both Fava and ICARUS have in common. When scientists proposed giving the detector an update at CERN and then using it in a suite of neutrino experiments at Fermilab, Fava volunteered to come along for the ride. Once installed and operating at Fermilab, ICARUS will be used to study neutrinos from a source a few hundred meters away from the detector. In its new iteration, ICARUS will search for sterile neutrinos, a hypothetical kind of neutrino that would interact even more rarely than standard neutrinos. While hints of these low-mass particles have cropped up in some experiments, they have not yet been detected. At Fermilab, ICARUS also won’t be buried below more than half a mile of rock, a feature of the INFN setup that shielded it from cosmic radiation from space. That means the triggering system will play an even bigger role in this new experiment, Fava says. “We have a great challenge ahead of us.” She’s up to the task. No fewer than three particle physics laboratories lay claim to some aspect of the detector, called ICARUS, that will soon become the newest member of Fermilab’s neutrino family. The Italian INFN Gran Sasso National Laboratory took data using the 760-ton, 65-foot-long detector for its ICARUS experiment from 2010 to 2014. The European laboratory CERN sent beam to the detector when it was at Gran Sasso. And Fermilab is soon to inherit the detector for its Short-Baseline Neutrino Program. Fermilab is currently awaiting the detector’s arrival from CERN, where staff have been refurbishing it for use in the SBN Program. So it is fitting that technicians, led by Frederic Merlet of CERN, from the two European laboratories recently converged at Fermilab to work with the U.S. ICARUS team, led by Fermilab’s David Augustine. 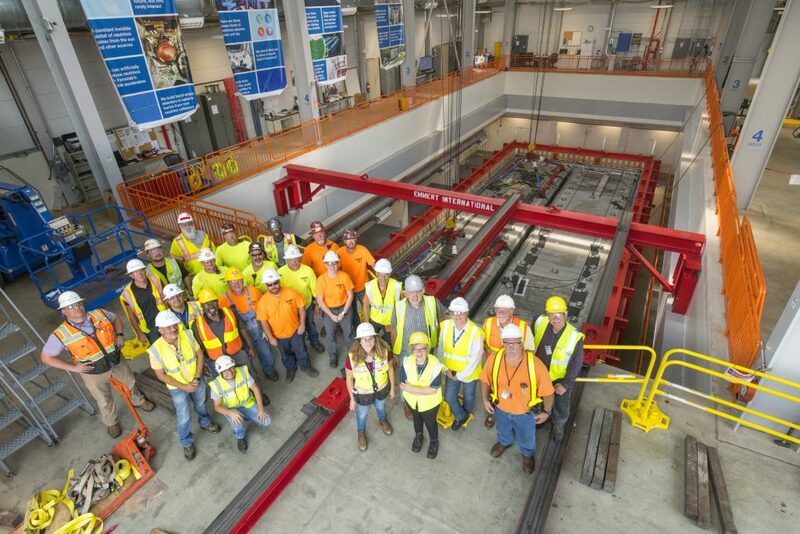 During the visit, which took place from May 1-21, the technicians assembled the steel structure that will host the detector’s two 300-ton time projection chambers. 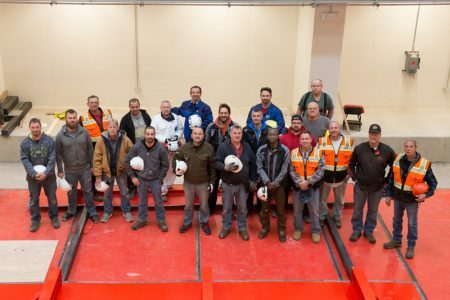 It was not only just technicians, but also machinists, quality and safety personnel, business administrators, and transportation coordinators who came together to prepare the detector’s future home. The contributions of our trans-Atlantic partners at CERN and INFN demonstrate once more that the science of particle physics is a global pursuit. Physicists working at the Gran Sasso National Laboratory in central Italy, located 1400 m under the mountain of the same name, are soon to start taking data from two new experiments. Each facility will target a different kind of missing matter: one will search for dark matter while the other will try and detect absent neutrinos to prove that neutrinos are their own antiparticle. The hunt for dark matter – the mysterious substance believed to make up about 80% of all matter in the universe but not yet detected directly – will be carried out using XENON1T. This experiment, which was inaugurated at an event at Gran Sasso today, consists of 3.5 tonnes of liquid xenon. It is designed to measure very faint flashes of light that are given off whenever particles from the dark matter halo of the Milky Way collide with the xenon nuclei. The xenon will be stored at a temperature of about –100 °C in a cryostat and surrounded by a tank containing some 700 tonnes of purified water to minimize background radioactivity. Run by an international collaboration of 120 students and scientists from more than 2 institutions, XENON1T is expected to be about 100 times more sensitive than its 160 kg predecessor experiment and around 40 times better than the world’s current leading dark-matter detector – the 370 kg Large Underground Xenon experiment in South Dakota, US. Due to start taking data by the end of March next year, XENON1T will either detect dark matter or place severe constraints on the properties of theoretically-favoured weakly interacting massive particles (WIMPs), says collaboration spokesperson Elena Aprile of Columbia University in New York. The other new experiment at Gran Sasso is the Cryogenic Underground Observatory for Rare Events (CUORE), which will look for an extremely rare nuclear process known as neutrinoless double beta decay. That decay, if it exists, would involve two neutrons in certain nuclei decaying simultaneously into two protons while emitting two electrons but no antineutrinos (unlike normal beta decay), implying that the neutrino is its own antiparticle. Due to turn on early next year, CUORE will measure the energy spectrum of electrons emitted by 741 kg of tellurium dioxide surrounded by radioactively inert lead blocks recovered from a Roman ship that sank 2000 years ago. Meanwhile, towards the end of 2016 another group of scientists at Gran Sasso should take delivery of about a kilogram of cerium oxide powder, which they will place several metres below the Borexino neutrino detector. The Short Distance Neutrino Oscillations with BoreXino (SOX) experiment will look for a sinusoidal-like variation in the number of interactions generated within the detector by neutrinos from the radioactive cerium. SOX leader Marco Pallavicini of the University of Genoa says that such a variation would be a sure sign of “sterile” neutrinos – hypothetical particles outside the Standard Model of particle physics that would “oscillate” into ordinary neutrinos but would not interact with any other kind of matter. 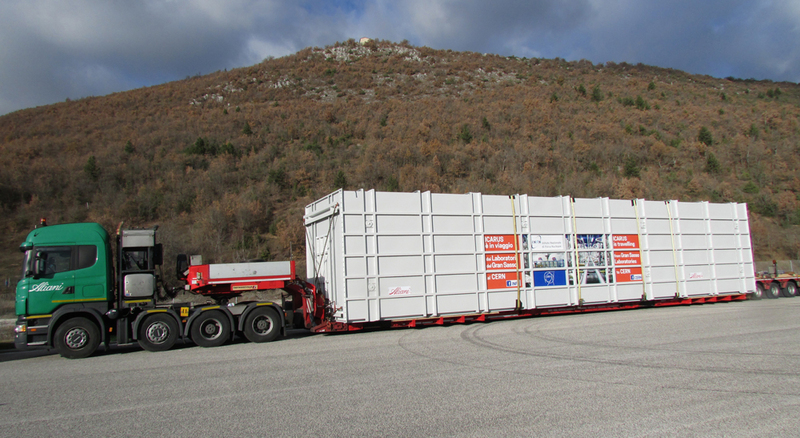 A giant neutrino detector is traveling by truck from the Italian Gran Sasso laboratories to CERN to get ready for a new life. On Tuesday night a 600-metric-tonne particle detector became the world’s largest neutrino experiment currently on an international road trip. 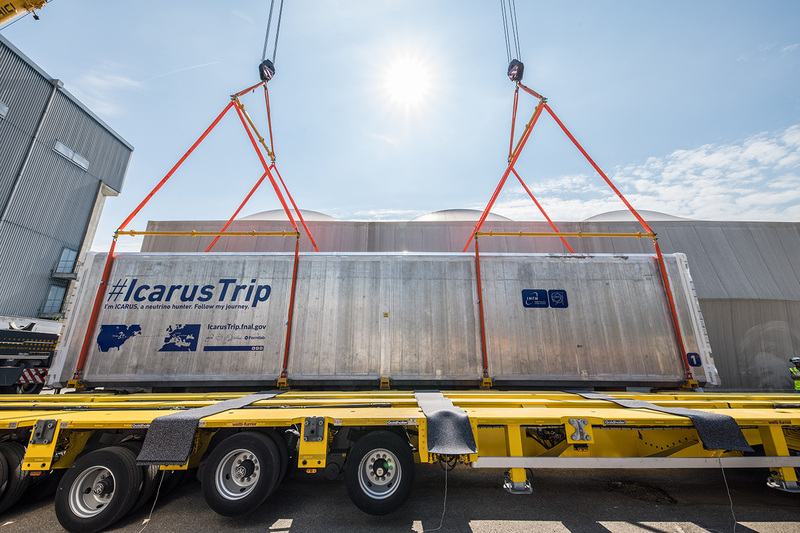 The ICARUS T600 neutrino detector—the world’s largest liquid-argon neutrino experiment—is on its way from the INFN Gran Sasso laboratories in Italy to European research center CERN on the border of France and Switzerland. Once it arrives at CERN, it will undergo upgrades to prepare it for a second life. Since 2010, the ICARUS experiment has studied neutrinos streaming about 450 miles straight through the Earth from CERN to Gran Sasso. Neutrinos come in three types, called flavors, and they switch flavors as they travel. The ICARUS experiment was set up to study those flavor oscillations. Its detector, which works like a huge, three-dimensional camera that visualizes subatomic events, has recorded several thousand neutrino interactions. Scientists see more experiments in the detector’s future, possibly using a powerful beam of neutrinos already in operation at Fermi National Accelerator Laboratory near Chicago. The detector is 6 meters wide, 18 meters long and 4 meters high. When in operation, it is filled with ultra-pure liquid argon and about 52,000 wires, which collect signals from particles and can reconstruct 3-D images of a what happens when a neutrino knocks an electron off of an atom of argon. To prepare the sensitive detector for transport, workers moved its inner chamber on sleds into a shipping container, says Chiara Zarra, the ICARUS movement and transportation coordinator. But getting the experiment out of its home was a challenge, she says. The laboratory layout had changed since ICARUS was first installed, and there were multiple other experiments to maneuver through. A team from CERN helped with planning by creating 3-D simulations of the operation. Over the course of about a week, the detector will travel on a special equipment transporter through Rome, Genoa and Turin. After that it will cross the Alps through the Mont Blanc tunnel on its way to Geneva.